RavenDB Client: this is a lightweight library enabling you to connect to any RavenDB server; it exposes all RavenDB's strengths to your .NET or Silverlight application. RavenDB Embedded: this is a full-blown RavenDB server ready to be embedded in your application. If you are not sure which to choose, go with the RavenDB Client. Only use Embedded if you are certain this is indeed what you need. Either of these can be added to your project by either using NuGet or extracting the contents of a build package. You can consume RavenDB through NuGet. Follow this article for instructions on how to do this. Grab a stable build from the downloads page, and extract the required files to a new "RavenDB" folder in your application. You'll then need to update your project with references to them. /Client - Lightweight RavenDB client for .NET 4.0. This is the recommended client to use. /Silverlight - A lightweight Silverlight 5 client for RavenDB and its dependencies. /EmbeddedClient - The files required to run the RavenDB client, in server or embedded mode. 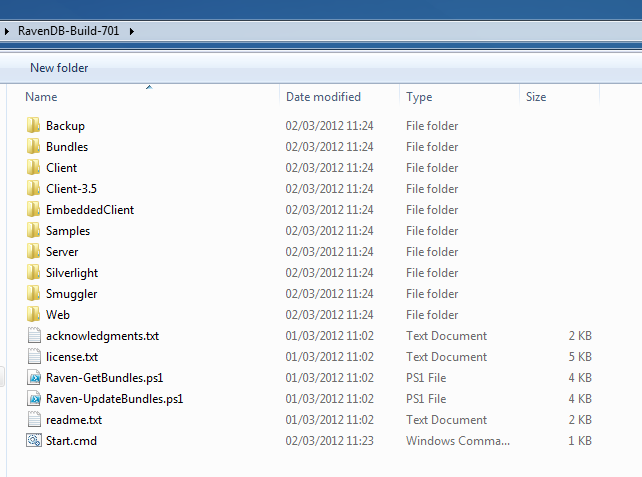 Whichever client version you choose to use, reference all the assemblies in the corresponding folder to your project. /Backup - Standalone backup tool, for performing backup operations using a user with admin privileges. /Bundles - Bundles that extend RavenDB in various ways. /Samples - Some sample applications for Raven. Under each sample application folder there is a "Start Raven.cmd" file which will starts Raven with all the data and indexes required to run the sample successfully. /Smuggler - The Import/Export utility for RavenDB. /Server - The files required to run RavenDB in server / service mode. Execute /Server/Raven.Server.exe /install to register and start the RavenDB service. /Web - The files required to run RavenDB under IIS. Create an IIS site in the /Web directory to start the RavenDB site. For more information on the various deployment options for RavenDB, see in the Deployment section of the chapter on the Server side.